you'll find a great fit from our collection. - Made with wrinkle-resistant fabric to keep creases at bay. - Has 1 extra cuff button and a reinforced left pocket. - Has embedded collar stays to keep things crisp. - Strong poly-cotton blend makes the shirts machine-washable. - Available in over 20 colors to suit any taste. 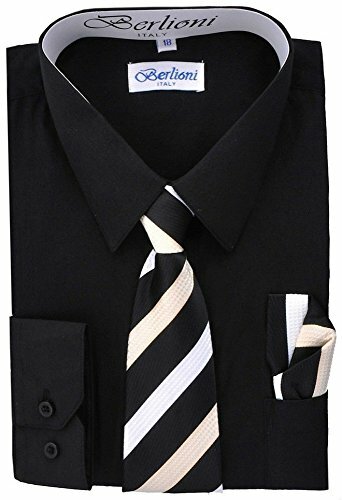 Click 'Add to Cart' now for a boy's dress shirt that combines classic style with great value! DAPPER SHIRT SET: Treat your little lad to a color-coordinated dress shirt set designed to turn heads. This long sleeve dress shirt for boys comes with a matching tie and hanky carefully picked by our stylists to make any outfit pop. KEEP THEM LOOKING SHARP: Every time is sharp o'clock in this boys' dress shirt. It comes fitted with embedded collar stays to create a need and tidy look around the clock. Choose from the suave colors and ensure your boy looks great at that event. TOUCH OF QUALITY: High-quality materials meet fine workmanship to create boys' button up shirts that look great and handle well in the wash. The long sleeved shirts for boys are machine wash-safe for a hassle-free clean. If you have any questions about this product by Berlioni, contact us by completing and submitting the form below. If you are looking for a specif part number, please include it with your message.